The Bar Guide Collection comprises three NYC Gay Guides. 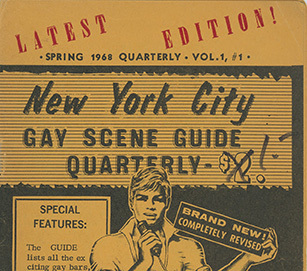 These are among the earliest Gay Guides held by the National History Archive. Guides such as these assisted Gays and Lesbians, especially those visiting or new to an area, to find where they could meet and interact with other LGBT people. They are a record of where the community met, how the community was divided into subgroups, and often a good indication of where the majority of LGBT people lived at the time. Some of the guides also indicate where there was danger from police or others who preyed upon the community. The Center's Archive has a large collection of these guides from all over the United States and from around the world. The Lesbian Gay Bisexual and Transgender Community Center National History Archive serves to preserve the history of the LGBT community and its rich heritage. Opened in 1990, the Archive provides a look into the lives and experiences of LGBT people throughout the years. The Archive houses more than 2000 feet of documents from organizations and individuals, and contains a wide range of media from as early as 1920, including photography, correspondence, personal journals, audio, and video. A catalog of the Archives manuscript collection can be found at www.gaycenter.org/archive.